Shave Your Lid for a Kid is Kids Cancer Care's largest fundraising initiative, raising more than $9 million since its inception in 1998. The shave program is successful because of you. Each year, hundreds of Albertans like you shave their heads for our kids. This bold move shows moral support for the kids who lose their hair during cancer treatments, while raising money for camp, research, hospital and scholarship programs for young people affected by cancer. 5 steps to a stellar shave. Set a fundraising goal, date and location for your shave. Register your shave online with Kids Cancer Care. Spread the word. Tell all your friends and family, teachers and colleagues about your shave. Share your fundraising goal with them and invite them to join your shave as a shavee or pledger. Contact their office for promotional ideas. Make your shave event fun. Invite your friends. Bring music. Have a BBQ for your supporters. Shave yourself a Mohawk first. Start a competition between shavees with a prize for the highest fundraiser. Shaving your head is a great way to raise money while showing moral support for kids who lose their hair during cancer treatments. If bald isn't your style, you can always opt for a haircut or pledge someone else who is shaving. Check out the new shave video here and share it widely. Shave Your Lid for a Kid is a grassroots initiative sponsored by Trico Homes and made possible by thousands of brave Albertans who shave their heads and raise vital funds and awareness for children with cancer. For more ideas on how to promote and organize your own shave or for help registering and pledging online, contact Leah Nelner at 403.984.1223 or email her at nelner@kidscancercare.ab.ca. To find out more about our Shave Your Lid for a Kid program, contact Leah Nelner at 403.984.1223 or email her at nelner@kidscancercare.ab.ca. Calgary’s Bow Building, 500 Centre St. S.E. Climb for Wilderness: 8:30 a.m.-11:30 a.m. Please note that by registering you have agreed to raise a minimum amount for this event. The 28th Climb for Wilderness will be held on April 27th at Calgary’s Bow Building, the best skyscraper in Canada. More stairs, even more magnificent vistas, and the excitement of a new venue await climbers. For the past 27 years, the Climb for Wilderness has challenged participants as athletes and fundraisers, supporting the wilderness we have in Alberta. The tradition continues, supporting education and awareness about wilderness and wildlife in Alberta and raising vital funds which ensure AWA can continue with its independent and non-partisan pursuit of wilderness conservation. The Bow Building will challenge climbers and families of all ages to 1,204 stairs, 54 floors and a 236 metre climb. Climb and Run for Wilderness is Alberta Wilderness Association's annual Earth Day event. The day is filled with entertainment, and this year launches the outstanding Wild Alberta show featuring the images of photographers from across the province at this event. There will be displays where you can learn more about Alberta’s wilderness, wildlife and wild waters. Children’s activities and opportunities to learn about wildlife are an important part of the day. You will have a terrific time! As well you can be eligible for outstanding prizes if you choose to fundraise. People of all ages, individuals and teams are welcome to participate. If you are aged 2 to 102 this is your Earth Day event. Mount Royal University, 4825 Mount Royal Gate S.W. 5 km Run/Walk: 8:30 a.m. The origins of the Calgary Police Half Marathon trace back to a conversation between two police officers out on a run together, late in the fall of 1979. They realized that half marathon races were fast becoming the standard in the running world and there wasn’t one in Calgary. Wanting to rectify this situation, they took their idea to the head of the police fitness unit, and together the group organized the first race, held on Sunday, April 27, 1980. Little did they realize they had started something that would become a fixture of the Calgary road running scene. Viewed by many as the first major run of the season, this run has a following like few others. Often the race becomes a true test of character with the ever changing weather conditions in Calgary. 2019 marks the 39th running of the Calgary Police Half Marathon. The goal of the Calgary Police Half Marathon Committee has always been to provide a premier race. Attention to detail and the quality of the performance awards and race give-aways have contributed greatly to the popularity of the race. The Calgary Police Service is a proud sponsor of the Calgary Police Half Marathon. The Service sees this event as just one more way to foster positive relationships with Calgarians. $1 is donated for every cyclist participant. 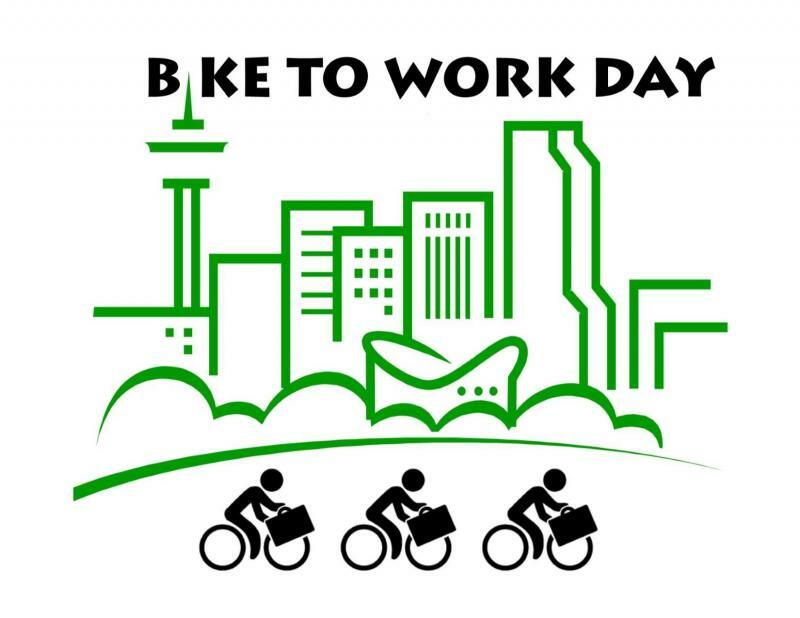 Bike to Work Day is celebrating its 13th year! On May 3, BTWD will celebrate its thirteenth annual event with even more enthusiasm, more participants, and more fun! As with previous years, there will be 10 different bicycle pit stops along the route, where you can receive tune-ups, (for you and your bike) and free giveaways. Everyone will then gather at Eau Claire Market for a free pancake breakfast, music and a chance to catch up with friends and colleagues. BTWD helps bring Calgarians together in sharing some common goals; promoting cycling as a viable means of transportation, reducing inner-city traffic, and of course reducing the pollution in the air we breathe. Cycling is a great addition to a healthy routine and it can be very cost-effective – not to mention, you look very socially responsible while reducing your carbon footprint. Every year, Lonny Balbi donates $1 for every cyclist who participates in Bike to Work Day to a local charity. In 2017 he donated $6,388 to Bicycles for Humanity, a 100% volunteer run grassroots organization which sends used bikes to developing countries. Their work supports grassroots projects that improves access to healthcare, education, employment, food and water, through the provision of sustainable transportation. In 2018 they supported Cerebral Palsy’s Adaptive Bike Program which ensures that children with cerebral palsy and other physical disabilities are still able to ride a bike and have fun with their friends, so even more participants came out to Bike to Work Day to help get more kids out on bikes! 6876 cyclists participated in cycling to work so $6876 was donated. There is no registration fee to participate in the Walk so Kids Can Talk. However, there is a suggested fundraising minimum of $100 per person. Terrain: The terrain has paved walk ways and bridges. 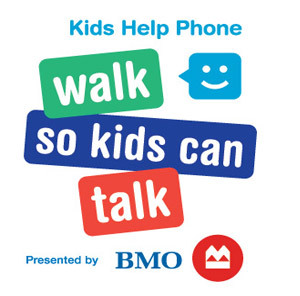 The Walk so Kids Can Talk presented by BMO (#BeAHero) is a fun and inspirational 5K walk where thousands of kids, adults, families, schools, community organizations, and corporations across Canada join together to support kids’ potential by raising funds for Kids Help Phone. It’s a terrific way to build community and enjoy a great experience outdoors while supporting an important cause: young people’s well-being.The Walk provides help and hope to kids everywhere, sending them the message that we walk together to make our world a more supportive place for them. On Sunday, May 5, walk to support Kids Help Phone to help youth feel more empowered to take on life’s challenges, big and small. Young people can talk about any concerns they have; sometimes, the Kids Help Phone is the first or only place they can turn to for help. Walk to ensure young people get the help they need 24/7. Held on the first Sunday in May since 2002, the Walk is Canada’s largest for child and youth mental health and well-being and kicks off Mental Health Week in Canada each year. Kids Help Phone is a free, anonymous professional counselling service supporting the mental and emotional health and well-being of Canada’s 6.5 million kids ages five to 20. Whether their problems are big or small, kids know they have a safe, non-judgemental place to turn where they can work through their feelings and get help finding answers, 24/7 and 365 days a year. 2019 marks Kids Help Phone’s 30th Anniversary — serving generations of young people on the issues that mattered to them. As a charity, theybrely on donations and funds raised from the Walk so Kids Can Talk presented by BMO to help continue to be there for youth for the next 30 years, wherever, however and whenever they need them the most. Parking & Festivities: 9:00 a.m.
Sunday, May 5 is National Hike for Hospice and the kick off to National Palliative Care Week. Join other families and community partners to raise funds and awareness of end-of-life care in Calgary. In 2018, more than 600 people joined in for this fun, family and fur-friendly event that raised $110,000 of critical funds and immeasurable awareness for clients and families. We will honour them. Before every hike honour those that cannot join in. Participants are invited to honour their person at this meaningful community event in the way that they wish (pictures, signs, shirt designs). Help reach the fundraising goal of $120,000! Funds raised support families living with advanced illness or facing the death of someone close to them. Come one; come all! Challenge your family, friends, neighbours, and co-workers as a team or come on your own and join the walk. Enjoy the morning's family festivities. Hike for Hospice Calgary is a fun, family and fur-friendly event. Arrive an hour early for refreshments, photo booth, face painting, Kids Zone, and Doggie Fun Zone. Strollers and wagons are welcomed; the path is mostly paved. Join in after the hike for a wrap-up celebration! Celebrate the end of the hike together, with treats and a wrap-up celebration. North Glenmore Park, 37th St. and 66th Ave. S.W. Two walks: 2 km. and 4 km. 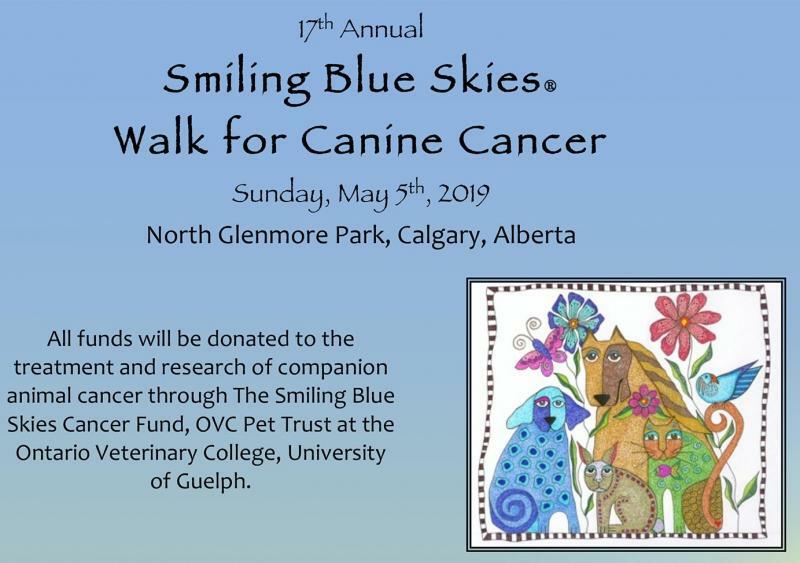 The OVC Pet Trust - Smiling Blue Skies Cancer Fund is a fund devoted to providing financial assistance for the advancement of health, health care, and quality of life, for companion animals. More than 120 studies into naturally occurring diseases affecting companion animals have been carried out with Pet Trust funds. To date, Pet Trust funds have been used for many special projects, including, investigations into common health problems, the development of new diagnostics and therapeutic techniques, studies involving the human-animal bond and animal behaviour, and the upgrading of the Small Animal Clinic's Intensive Care Unit. Receipts for tax credit purposes, are issued for all contributions to OVC's programs, under the University of Guelph's charitable status number. Since 2010, this small Calgary walk has raised over $220,000 for the Smiling Blue Skies Cancer Fund! Cancer is the most frequent cause of death in dogs. This is a truly frightening thought. It is a burden that we all share. In loving our dogs, whether pure breeds or mixed breeds, we want the very best for them, in health, and in sickness. Every dollar donated to The Smiling Blue Skies Cancer Fund supports OVC's quest to find more and better ways to deal with and understand this terrible disease. Thanks to you, we are making a difference. Please join in helping our animal companions, along with our human family and friends, by taking a bite out of cancer. Flames Community Arenas, 2390 47 Ave. S.W. Luncheon 12:00 – 2:00 p.m. Luncheon Tables: $5,000 – a reserved table of 8 plus an NHL alumni guest (total 9 guests). Receive a charitable tax receipt for $4,000. Option to credit $5,000 towards a player or team’s fundraising efforts. The luncheon is an opportunity for the Calgary business community to be part of an intimate chat with Canadian icon, Bob Cole. Sportsnet’s Eric Francis will sit down with his esteemed broadcasting colleague to delve into five decades of hockey stories and history witnessed by the Hockey Night in Canada legend. Enjoy a first class lunch with some of the game’s greatest players while the voice of hockey shares tales of his incredible journey. Evening Program To Commence At 7:15 p.m. Draft To Commence At 7:45 p.m. This exclusive event is a highlight of the weekend. Spend the evening with some of hockey’s greatest players. The draft night is your chance to draft a player based on fundraising rankings and spend the weekend playing hockey with your hockey heroes. The more funds your team raises, the higher you draft. After you draft your NHL Alumnus, he spends the weekend with your team. To be eligible to play in the 2019 Calgary Pro-Am Hockey tournament, teams must raise a combined minimum of $25,000 through individual and/or corporate donations. Draft positions will be determined by the total dollars raised. Teams will then spend the weekend playing hockey and sharing stories and camaraderie with some of the Alumni’s greatest. Teams will consist of 11 (minimum) to 17 (maximum) players plus one coach. Teams will be divided by skill level into the following age divisions: 30+, 35+, 40+ and 50+. Teams in the 30+ age division are allowed one goalie who is between 25-30 years old. In all other age divisions, teams can have one goalie and two players who are within five years of the minimum age for their division. The The Gordie Howe C.A.R.E.S. PRO-AM Hockey Tournament will be hosted at Flames Community Arenas from May 11-12, and FREE of charge for all fans to come down and watch. This world class event puts together weekend hockey warriors with their heroes from the NHL Alumni in a fun filled weekend focused on raising funds towards Alzheimer’s. The Alzheimer’s Pro-Am has raised over $5 million dollars over the past four years. All proceeds to date have gone towards furthering the research and awareness of what many believe to be Canada’s future largest epidemic, Alzheimer’s, dementia and related mental illnesses. All future funds will go towards programs, education, training, research and care for those suffering with Alzheimer’s/Dementia disease. The weekend kicks off with a luncheon on Friday, May 10th, followed by the draft night and a 2 day tournament at Flames Community Arenas. This charity event pairs local amateur hockey players with the favourite NHL Alumni like Bryan Trottier and Lanny McDonald as they drop the puck in the battle against Alzheimer’s and other related dementias. Don’t miss this chance to play hockey with and against some of your favourite former NHL players, while creating lasting memories and raising money for a great cause. Hang out with your teammates and meet a host of NHL alumni as you revel in the excitement and team spirit at our exclusive Draft Night. Enjoy the unique and coveted opportunity to draft a former NHL great to join your team. Imagine spending the rest of the weekend with your new teammate playing hockey, swapping stories and sharing locker room camaraderie! Team photos and personalized autographs from former NHL personalities will capture memories that last a lifetime. Experience exceptional dressing room amenities and services including personalized team jerseys, nameplates and a special gift package. Indulge in complimentary food and drink with your team after a great game of hockey. Enjoy an incredible weekend of hockey and camaraderie and take great pride in knowing you are helping raise funds to fight Alzheimer’s disease and other related dementias. Currently, 40,000 Albertans are living with dementia, and this number is set to double over the next 15 years. Gordie Howe C.A.R.E.S. Centre for Alzheimer’s Research and Education Society is a registered charity, supporting local people living with dementia and their caregivers through the delivery of education, support services and Adult Day Programs. It also supports Dementia Network Calgary – a cross-sector movement tackling the social and systemic challenges of dementia. Gordie Howe C.A.R.E.S. will be hosted in the State-of the Art Seniors community, Fish Creek Manor Village overlooking Fish Creek Provincial Park. This facility will have both Independent and Assisted Living, in addition to specialized memory care neighbourhoods. C.A.R.E.S. will provide much needed educational and research opportunities, as well as a dementia day support program offered to the public. More specifically, from a Research lens we are very interested in understanding how diet, sleep and exercise play a role in someone’s ability to “fight” delay or arrest the onset of dementia symptoms or the pathological markers associated with the disease. C.A.R.E.S. will allow for the Grass Roots research findings to be shared with the Calgarians. The endeavours at C.A.R.E.S. are generously supported through the auspices and fundraising of the annual Gordie Howe C.A.R.E.S. Pro-Am Hockey Tournament and Luncheon. The Net Proceeds of the sponsors and partnerships will support the design and development of the Non-Profit C.A.R.E.S programs and services for Calgary and surrounding area. 5 km & 10 km Wheelchair: 8:50 a.m.
10 km & 5 km Handcycle: 8:50 a.m.
10 km & 5 km Run: 9:00 a.m.
5 km Walk: 9:15 a.m.
Little Legs Race: 10:45 a.m. It's time to get ready for the 42nd Annual Sport Chek Mother's Day Run & Walk in Calgary. This event continues to be Alberta's largest family fundraising event with over 22,000+ participants last year. This year, the funds from the Sport Chek Mother’s Day Run & Walk will be in support of Jumpstart and The Calgary Health Trust. The Sport Chek Mothers Day Run & Walk (formally the Forzani Group Foundation Mother's Day Run & Walk) has been supporting health care in the community for over 40 years. This event has supported the Calgary Health Trust (Neonatal Intensive Care Units – Foothills Medical Centre, Rockyview General Hospital, Peter Lougheed Centre & South Health Campus) for the past 10 years raising $2,000,000 for much needed equipment at each location. This year will continue to support the Calgary Health Trust (NICU) and Canadian Tire Jumpstart Charities as a donation recipient. Jumpstart is more than just about getting kids active. It’s about giving kids from families in financial need the same chance to participate as their neighbours, their classmates and their friends. No kids should be left out! Click above to register, pledge, donate, or for more info.